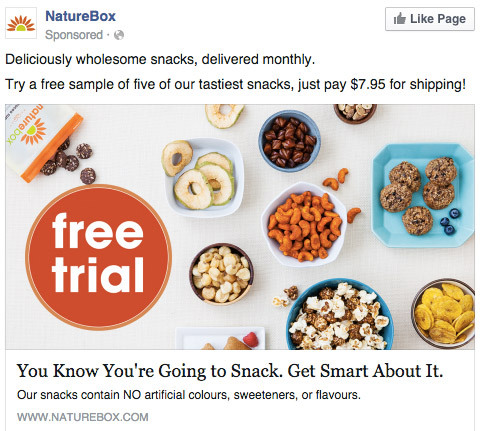 Are your Facebook ads targeted well? Do you have great content but are still struggling to increase your Click-through-Rate? 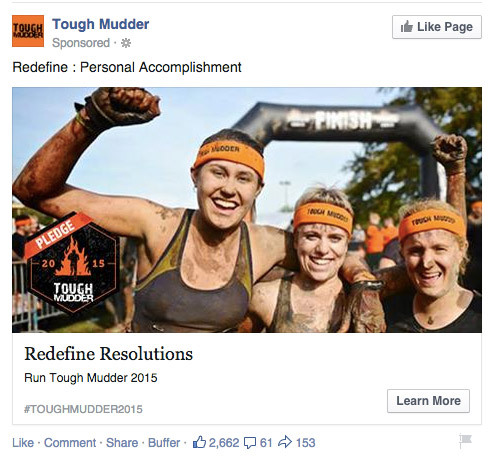 In this article I’ll explain six best practices for selecting Facebook Ad images. I’ll take a look at six examples where these best practices have been utilized, and one where they’ve been ignored entirely. This will give you a clear idea of what works and what you should avoid at all costs. To be perfectly frank I only agree with two of Facebook’s ad image best practices. As you well know (and I’ll debunk in the “Children and Pets’ section below), it is in no way essential for Facebook advertisers to choose an image directly relevant to their product or service. A picture of a completely unrelated tiger is just as eye-catching (if not more so) as a picture of the mobile phone you’re selling. And while I agree your images should most definitely avoid small details, text can be a great eye-catcher. For instance, the word ‘FREE’ emblazoned in orange across a blue background will definitely catch a Facebook user’s eye. Value Propositions (see below) also work well. Bright and eye-catching? Now that is absolutely 100% essential. Before we take a look at some image examples, make sure your image is the right size and shape. For all ads, Facebook recommends your image be 1200 pixels wide, and no smaller than 600. However, as most businesses are running right-column ads I’d like to say Facebook’s best practices here are again a bit ridiculous. A 144 x 72 pixel-wide image (below on the right) looks exactly the same as a 1200 x 600 image (below on the left) when you shrink it down 800%. In case you were wondering, Facebook now allows the same image to be used in both desktop and mobile advertising. As I’m sure you’ll notice with Healing Paws Veterinary Care below, your image also needs to be in landscape (and far less detailed as well). 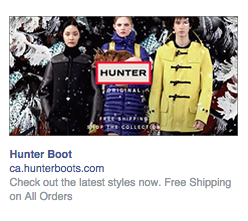 The image that has proved to convert best in Facebook ads is of a happy woman looking directly at the camera. FortisBC uses this strategy below, simply by showing a woman (and her baby) enjoying their company’s product. It will come as no surprise that Facebook’s color scheme is blue and white. If you employ the same colors your ad will blend into the News Feed and people’s already tired eyes will skip over it. An easily-recognizable logo may not attract the eye as well as a woman, a lot of color, a baby or a pet, but over time they’ll encourage conversion as Facebook users see it consistently and often. Hunter Boots, below, prominently features their logo to increase brand recognition, and, as they’ve only targeted it within the area they have branches, it’s valuable brand recognition as well. Only use your business logo if you are confident that your audience will recognize it. Otherwise Facebook users will skip over something they don’t think is related to them. Be sure to still include color within your image. A great value proposition will increase click-through, but won’t attract the eye without color. As two of the top five most-shared images on social media, pets and children are always a safe bet for your Facebook ad image. Telus and AdRoll have chosen a cute cheetah and child below. Both images really bring home the fact that your image by no means has to be clearly associated with your product or service. The goal of your image is to attract the eye, leave the message to your title and ad copy. For instance, if your product is an A/B testing ebook, how about a picture of twins in different hats? Depending on your business’ audience, employing a funny or odd image can seriously increase your conversion rates. Not only do they attract the eye, they encourage your reputation as a fun, casual brand. If this is what you’re going for as your Facebook brand persona, go with it. If not, steer clear. BarkBox has found a great image below. It’s eye-catching and also promotes their product (as the dog seems pretty happy with his BarkBox). Asking your Facebook Fans for user-generated content (through a photo or Pinterest contest for instance) is great for uncovering funny, interesting, or inspiring images. Knowing the top six image categories for Facebook is extremely valuable, but you should still test your individual images to be sure you’re getting the best response rate. BlueNile is split testing the advertisement below - changing only the image to see which people respond best to. If you feel an advertisement should be performing well, but isn’t, try changing its targeted demographic before throwing it out. Hopefully you now have a better idea of what images work best for Facebook advertisements. Remember to test what people respond to for your own company, and watch your competitors to see what’s working for them. Have you had any success split testing your Facebook advertisements? Are there any images you’ve found work best for an SaaS company? What about eCommerce businesses?